We made this recipe with standard green zucchini, but it would be equally delicious with any tender summer squash, such as yellow crookneck, pattypan, white or gold zucchini. Try using a combination of squash to vary the color on the plate. Combine zucchini rounds and lemon zest in a medium bowl and toss to coat zucchini. 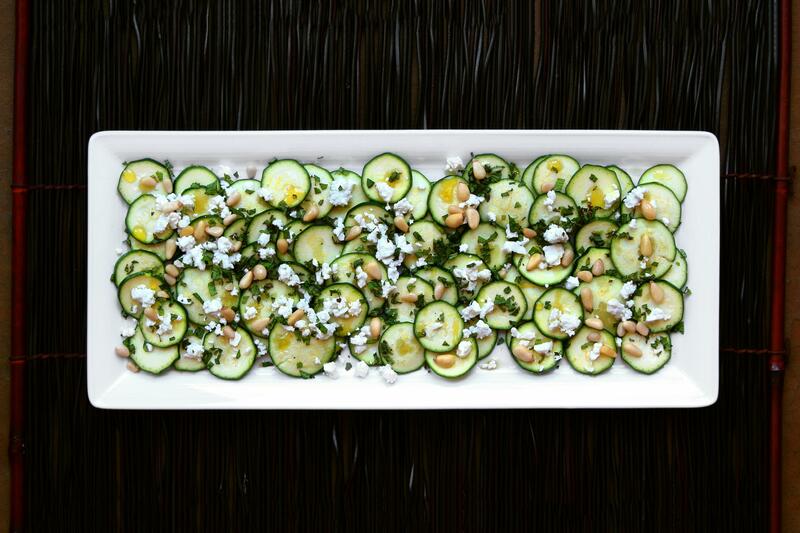 Arrange zucchini on a platter, slightly overlapping the slices. Drizzle with olive oil and sprinkle with salt and freshly ground black pepper. Sprinkle remaining ingredients over zucchini and serve. Works best with paper thin cut zucchini. I like to use an electric salad shooter to cut these, but a mandolin or skilled hand and sharp knife will work as well.